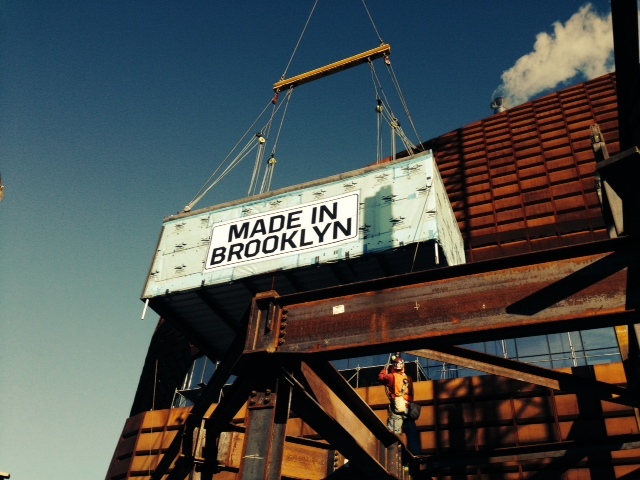 The first mods were hoisted into place yesterday at the B2 residential building at Atlantic Yards in Brooklyn. When completed in late 2014, the structure is poised to claim the title of world’s tallest modular building and will include 50 percent affordable housing. With 181 of the 636 units available as low-income apartments, B2 will be “by far the largest infusion of affordable housing in Brooklyn at one time” according to the Forest City Ratner Companies (FCRC) press release. FCRC partnered with Skanska USA to form a new company called FC + Skanska Modular, LLC to build the mods in a new 100,000 square-foot space in the Brooklyn Navy Yard. B2 was designed by SHoP Architects and Arup. Union labor built the mods with more than 100 workers currently employed at the factory. The union labor is affiliated with the New York Building and Construction Trade Council (BCTC). The B2 project is part of the first phase of the $4.9 billion Atlantic Yards redevelopment across 22 acres. Phase One includes the completed Barclays Center sports and entertainment complex, B2 and four other buildings. Architect Frank Gehry designed the master plan for the project. First mod being hoisted into the B2 building at Atlantic Yards. The first mods were hoisted into place yesterday at the B2 residential building at Atlantic Yards in Brooklyn. When completed in late 2014, the structure is poised to claim the title of world's tallest modular building and will include 50 percent affordable housing. With 181 of the 636 units available as low-income apartments, B2 will be "by far the largest infusion of affordable housing in Brooklyn at one time" according to the Forest City Ratner Companies (FCRC) press release.